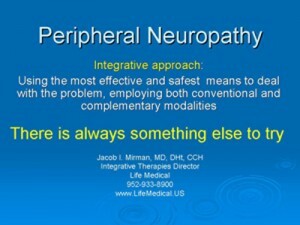 Today I made a presentation to the Minnesota Neuropathy Association. About 50-60 people showed up and we had a lively discussion. I will try to capture the essence of this discussion in the following article. First we talked about integrative medicine in general. The point here is to use all available techniques, without prejudice and preconceptions. Some of them will be conventional, some so called “alternative” (a bad term! ), but the idea is to INTEGRATE all useful techniques, as long as they are safe and could be effective. One must always remember that there is always something else to try, even when everything you’ve tried so far failed. 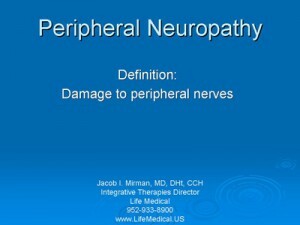 Peripheral neuropathy, by definition, is damage to peripheral nerves with resulting change of function of those nerves. The nerves involved can be many or just one or a few. For example, carpal tunnel syndrome or shingles are focal neuropathies, affecting only one nerve: median nerve or a spinal nerve. 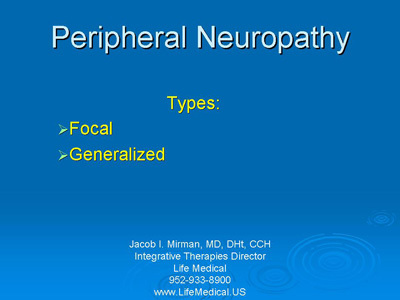 Examples of a generalized type of peripheral neuropathy would be diabetic or alcoholic peripheral neuropathy, or one from some other toxicity or general inflammatory condition like lupus, presenting as pain and numbness in fingers and toes on both sides of the body. This slide briefly summarizes possible symptoms. Presentation can vary between people. There are many causes for this condition. The most common cause is diabetes. 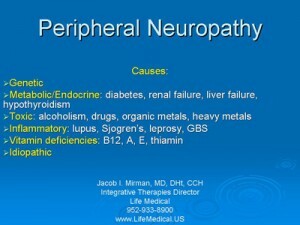 Most non-diabetic cases are considered “idiopathic”, which is a smart way of saying “we have no clue why you got this”. You have to realize that doctors really don’t know much. Medicine as a science is in its infancy. We think we know a lot, but those of us with wisdom know that what we don’t know in medicine is way more than what we do know. So it pays to have some humility and willingness to show it by being honest about how much we do not know. As with any condition, first we need to make every effort to remove the cause of the condition, then stimulate the nerves to heal and, in the meantime, while the healing is in progress, provide the patient with symptomatic relief. 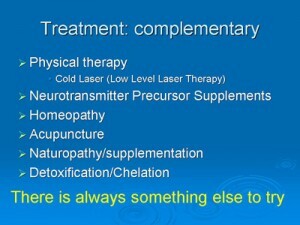 Just giving medications for the discomfort is not a good answer. A person approached me with a question after the presentation. 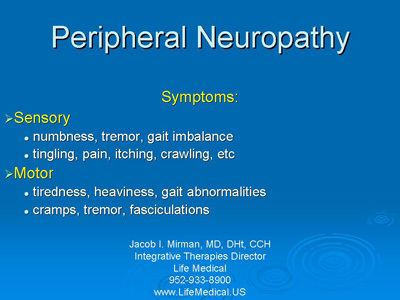 She said she has frequent urinary tract infections, and the antibiotics used to control these infections are causing peripheral neuropathy. She was asking if I know what antibiotic would be better in her situation. I explained to her that her question was altogether wrong. The question should be: what can we do to stop the UTIs from occurring in the first place, so she would not need to use any antibiotics. I explained to her that in her case homeopathy may be able to provide the needed relief from constantly getting these UTIs, and then once she is off the antibiotics, the damaged nerves may be able to heal. There can be many different ways to classify available treatments: conventional vs. complementary/alternative, curative vs. palliative, or what I call “hardware” vs. “software”. Read more about it here. 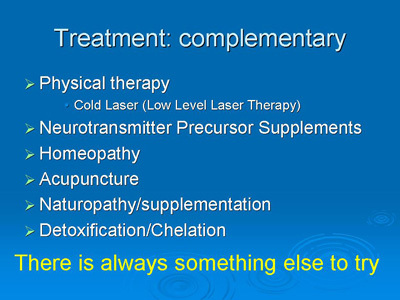 The conventional palliative treatment modalities are on this slide. Palliative means providing only symptomatic relief, without addressing the underlying problem or attempting to relieve the condition permanently. 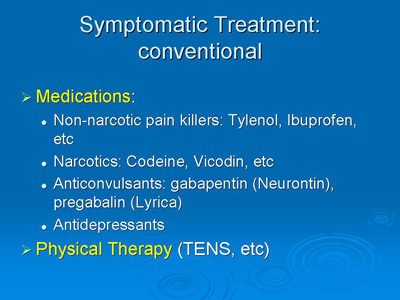 The anticonvulsants listed here are sometimes helpful, but often at the expense of dulling down the patient. 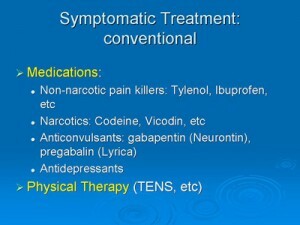 The whole point of these drugs is to dull down the nervous system, so it would have less symptoms. So, obviously, everything is dulled down, including the patient’s mental state. It is not so noticeable for some patients, but totally intolerable to others. 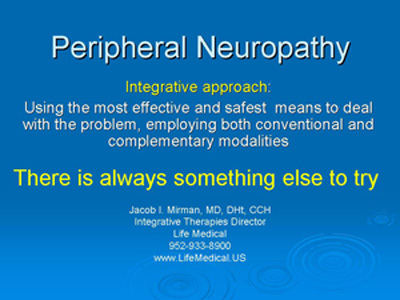 Some complementary modalities can offer a lot of relief to peripheral neuropathy sufferers. We discussed all these in some detail. Please follow the links to get more information. 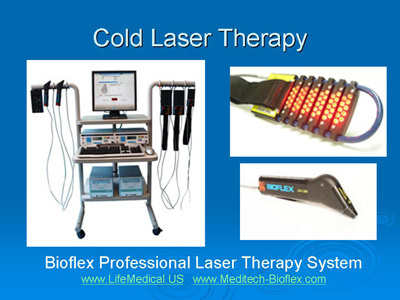 Cold Laser is a method to stimulate the nerves to heal. 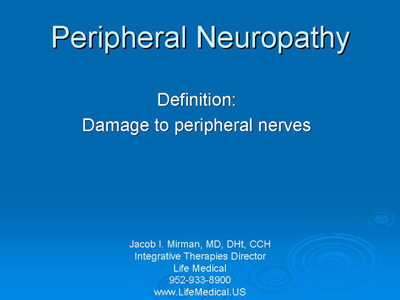 It is quite effective in a variety of conditions, including peripheral neuropathy. We use it in our clinic as part of overall physical therapy protocol for treating numerous conditions, like osteoarthritis, injuries, etc. Bad knees improve and patients can often postpone or cancel knee replacement surgeries. Rotator cuff tears (shoulder injuries) heal up and surgeries to repair them are cancelled. Carpal tunnel syndrome goes away. All sorts of tendonitis, sprains, strains, etc, improve. TMJ improves. I can go on and on. There were a lot of questions from the audience about this innovative therapy. I can’t discuss it all here. Homeopathy can be very effective in helping the body deal with the underlying condition, as in the case mentioned above. 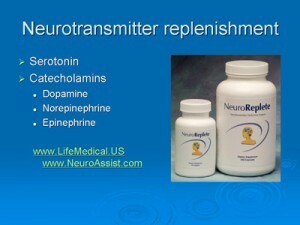 NeuroReplete supplements are very useful in people with all sorts of chronic pain. These supplements basically work like an antidepressant, without the side effects seen with most antidepressants, and much more effective. Doctors often give antidepressants to people with chronic discomfort. This approach works much better. As a side note, these same supplements work for anxiety, migraines, fibromyalgia, ADD/ADHD, and as an aid in a well structured weight loss program. There is no better and safer appetite suppressant on the market. And this is a personal testimony: the only way I can keep my weight in a healthy range is by taking these supplements regularly. What can I say, some of us are born pigs, and this method offers us real help. Interestingly, those without abnormal hunger issue usually do not experience appetite suppression. If your peripheral neuropathy is due to diabetes and you are overweight, there is no better way for you to get healthier than to lose weight. In most cases, given enough weight loss, diabetes goes away and peripheral neuropathy improves. 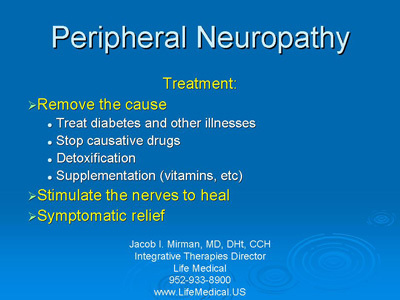 Detoxification is often important, because peripheral neuropathy is sometimes caused by certain toxicities. This is best accomplished by seeing a naturopath or a medical doctor familiar with the process of detoxification, such as oral or IV chelation therapy. I often refer people to doctors I know, using this modality. Vitamin or other nutrient deficiency may also be an issue, and is also best addressed by such a specialist. The main thing to remember: NEVER GIVE UP! THERE IS ALWAYS SOMETHING ELSE LEFT TO TRY!